Do you wonder what to do with those unique vegetables you find at the farmer's market and in your farm produce Community Supported Agriculture (CSA) box? Eating locally grown food has many benefits for our land, local economy, and our health. For those of us not accustomed to local produce, it takes practice to learn what these new (sometimes strange) vegetables are and how to make them taste delicious. If you get a new food in your CSA farm share box, start with the newsletters from your CSA farm. Most farms send a newsletter each week with recipe and preparation tips for the produce in that week's share. Often these newsletters and recipes are archived on farm websites to look back through as well. Another resource, and the "go-to" book in my kitchen, is From Asparagus to Zucchini: A Guide to Cooking Farm-Fresh, Seasonal Produce, 3rd Edition published by Madison Area Community Supported Agriculture Coalition. In this indispensible book, the vegetables are listed alphabetically and each entry lists history, cooking tips, storage tips and recipes. Below are tips on a few of the vegetables you will frequently find at farmers markets and in CSA share boxes during Wisconsin's growing season with facts about their stellar nutrition and some recipe ideas to get you started. Enjoy the new tastes as you explore these nutrient-rich foods from the Midwest! Garlic scape is the green flower shoot that grows above ground as the garlic bulb develops under the soil. Farmers trim off the scapes to encourage the garlic bulb to continue to grow in size. Scapes have the same nutritional benefits as garlic, rich in flavorful phytochemicals that protect us from disease. A scape looks very much like the green part of a scallion and can be used in a similar way. The garlic flavor of a scape is often more mild that that of the garlic bulb. It can be eaten raw or cooked. Try dicing it raw and adding to green or pasta salads, scrambled eggs, adding to a veggie saute or using as garnish for rice. Garlic scapes can stand on their own as a vegetable dish, lightly sautéed or tossed in olive oil and grilled. Chard (also called Swiss chard) is a favorite dark leafy green of many. Chard is high in fiber, vitamins A, C and K and is a good source of iron, calcium and other minerals. The deep colors in chard varieties (some with red or yellow stems) hint at the huge variety of phytochemicals this plant has to offer. It is one of the most nutrient-rich vegetables in the world. Small tender leaves can be eaten whole, while you may want to remove the tougher stem on larger leaves before cooking. Chard can be used in any recipe calling for spinach. Add to stir fry, soups, salads, or sauté on its own for a delicious vegetable dish. Celeriac (also called celery root) is a rough looking root vegetable related to the common celery plant. It is a great source of vitamin C, phosphorous and potassium. Scrub the outside well under water to remove dirt before using or peel off the outside if you prefer. (Peeled celeriac will darken. Lemon juice can be added to slow darkening). Slice raw celeriac into sticks for munching, or shred some into your salad. Try boiled celeriac mashed with your potatoes. Use celeriac anywhere you would use celery. Fennel is a pale colored bulb off which many shoots grow, topped by delicate leaves that look similar to dill. It has a flavor similar to anise and has been used for centuries as a food and herb. Fennel is a significant source of vitamin C, fiber, potassium and folate. 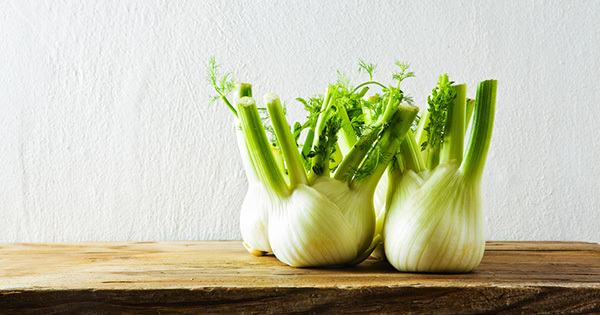 Bite into a fennel stem or piece of the bulb to get familiar with the flavor. Fennel can be eaten raw or cooked. It can be baked, steamed or sautéed. Sauté sliced fennel with onions in 1-2 Tbsp of olive oil for a side dish. Fennel goes well with salmon. Grill fennel, peel and slice into 1/3 inch thick pieces, steam for 8-10 minutes, then brush lightly with olive oil, grill 6-8 min per side until tender and lightly charred. Serve with grilled onion slices and sprinkle all with shredded parmesan cheese. For more recipes using these unique vegetables follow our Healthy Recipes board on Pinterest. Follow UW Health's board Healthy Recipes on Pinterest.